If you are seeing various commercial advertisements on your screen and have already detected Sale Charger, there is no doubt that this program generates them. It is not surprising that this program acts like that because Sale Charger is a typical advertising-supported application (adware). If you want to find out some information about this threat, you should know that it only shows ads and does not do anything beneficial. Of course, adware programs seek to convince computer users to download them, so they make many promises and users often think that they are useful and might improve a browsing session. Unfortunately, this is not true, so it is better not to keep Sale Charger installed on your system. The easiest way to remove Sale Charger is to access Control Panel and then remove this program from there. Sale Charger is based on the Injekt engine, and it is only going to generate and display commercial advertisements, even if it says that it will help you to find what you are looking for on the web. Advertisements generated by this program are not only very annoying, but they also might expose you to threats, so it is better to ignore them all. Keep in mind that you might be exposed to threats after clicking on a single commercial displayed by Sale Charger, so we recommend being very cautious in order not to cause harm to your system. You should know that adware programs also track users to provide ads. Put an end to this by deleting Sale Charger. 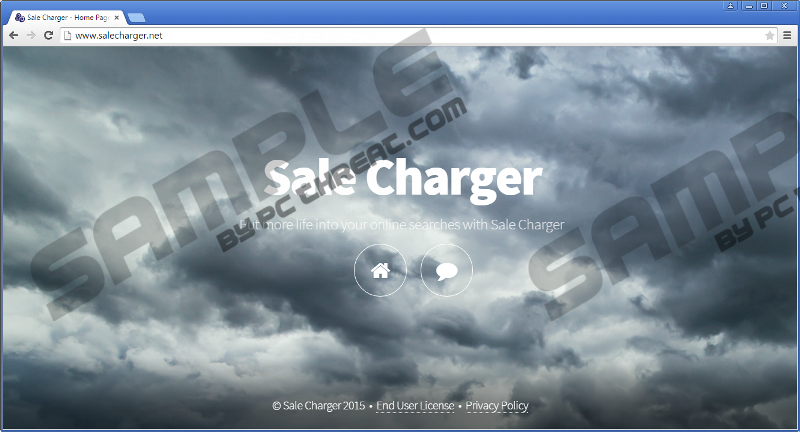 Even though Sale Charger has an official website (salecharger.net), it does not seem that it is possible to download it from there, so we think that this program might have entered with the help of other untrustworthy applications. These applications might have been installed on your computer as well, so you should definitely check your system’s condition in order to find out whether other infections are installed. In case you find them, delete them without any further consideration because they might cause harm to your PC if you keep them installed. Sale Charger can be uninstalled via Control Panel. In order to find out how to do that, you have to follow our manual removal instructions step by step. If you do not think that you will be able to remove this adware yourself, you can scan your PC with SpyHunter or another security tool and it will erase all the threats for you. On top of that, you will not have to worry about future threats anymore because an automatic tool will protect your system from future malware. Right-click on Sale Charger and click Uninstall. Access the Metro UI and start typing Control Panel. Quick & tested solution for Sale Charger removal.